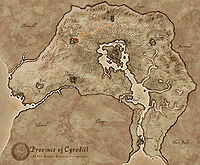 The Orange Road runs west to east from Chorrol to Bruma. At its western end it joins with the Black Road; at its eastern end it links up with the Silver Road. For more information, see the Oblivion Orange Road article. This page was last modified on 31 July 2013, at 01:19.